Our drive here from Kerrville was uneventful and, as we had been told by many in the know, the traffic we encountered as we neared Austin was daunting. 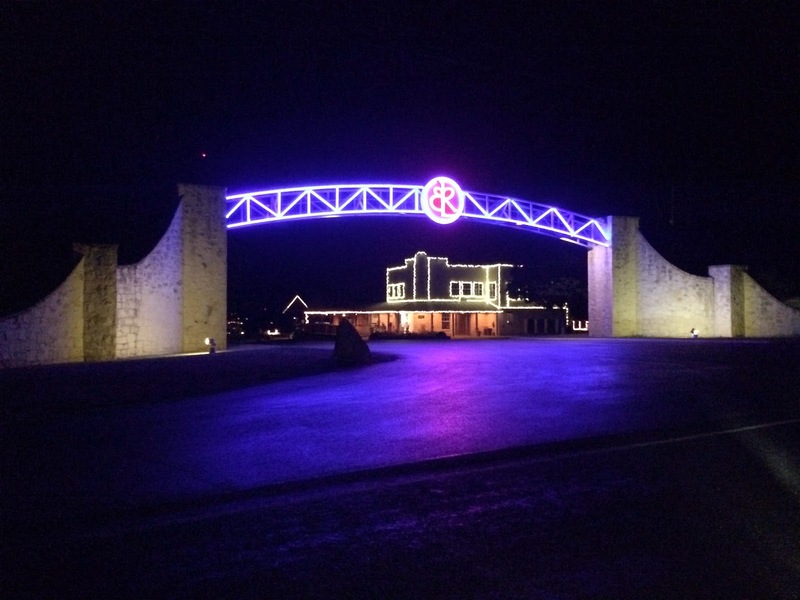 However, La Hacienda is a nice and quiet RV park that is tucked away from the traffic on a quiet peninsula that protrudes into Lake Travis northwest of downtown Austin. When I registered at the office, the clerk gave me the customary park map and drew a line on it with a Sharpie showing where I was to park. When I went back outside and sat down in Phannie's cockpit, I looked at the map again and compared it with the visual image I was seeing through the windshield--pretty standard stuff, right? Except what I was seeing through the windshield didn't match what I was seeing on the map! Not even close. Now before you write this off as incompetence on my part, you should know that I am no stranger to maps. In 15,000 hours of flying, I can assure you that I have plenty of map-reading experience, although I don't often need one to find my way around, as I have always had a very good sense of direction. This was the only case I can remember where I was completely stumped after turning the map every which way to try to make sense of it. Now Sandy will tell you with great exasperation that I am no different from most guys in being reluctant to ask for directions. I think I can speak for 90 percent of us males in telling you that we would almost rather have a prostate exam than to suffer the indignity of admitting that we don't know where we are or to ask where something is. Yes, we see asking such things as a sign of weakness and no, we're not going to change; it's in our DNA. So, rather than go back inside and admit to a (female) clerk that I couldn't figure out where to go, I unhooked Mae and commandeered Sandy to drive me around the park in the little car while I looked for site B3. We finally found it, although quite by accident, having misidentified another site as ours. This was mainly because the site numbers had been rather ineptly hand painted on the bases of the utility posts. I'm glad to have done this scouting around the park in Mae; it would have been a pretty embarrassing spectacle to drive the monstrous Phannie and Mae up and down each of the rows looking for our parking place. You see, not only do we guys 1) not like to ask for directions, we also 2) don't like to appear lost. Unfortunately, because of (1) we often find ourselves experiencing (2). We can't win. I do intend to tell the park management that they should make sure they hire a sober mapmaker next time. It might help. The Texas hill country has its own unique identity that's not easy to describe because part of its charm is in the feeling one has about it, especially among native Texans, I think. Not to diminish the connection that non-natives can develop for the state, but most Texans by birth seem to exhibit a love for this immense state that is not unlike a love of country or love of the family farm. 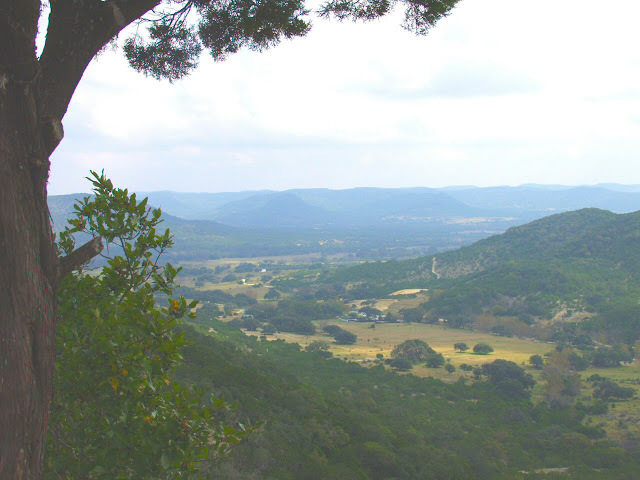 The hill country is like a bauble on a grand dame, joining other jewels like the piney woods of east Texas, the sawgrass of the gulf coast and the rugged crags of Big Bend to make up her whole persona. It's as much of an air, or feeling, as it is an appealing landscape. Traveling through these rocky hills reveals not the majestic grandeur of the Rockies but the almost audible heartbeat of a land of legend and mystique, both wild and winsome at the same time. The undulating change in dimension between land and sky creates a different visual treat with the rounding of a curve or the crossing of a crystal stream. Surveyed from the top of a ridge, the hills seem to stretch without end, passing under cottonlike clouds at the edge of an impossibly blue sky. At day's end, the sun brushes gilded clouds onto a pink and purple canvas as it reluctantly leaves to shine on lesser lands. Marveling at God's handiwork, I can't help but get a lump in my throat and think that it is all so very Texan. Now while it may be a bit self-serving to quote myself, the passage above portrays not only a pride in my state, but a love of the One who created it and an appreciation for the lifestyle through which I continue to discover and enjoy it. I don't think I could describe it any better now than I did then. "Surveyed from the top of a ridge, the hills seem to stretch without end..."
"At days end, the sun brushes gilded clouds onto a pink and purple canvas..."
Okay, enough reminiscing. Let's talk about the next day's adventure: Our next stop with our friends (stops almost always include a meal, by the way) was in nearby Camp Verde, Texas. This is the home of the Camp Verde General Store and Restaurant, our lunch target for that day. The store was founded as a result of the building of Fort Verde, the site of an unusual experiment championed by U. S. Secretary of War Jefferson Davis in 1854. Davis, who later became president of the Confederacy, purchased camels and dromedaries from the middle east to determine if they would perform better than horses and mules for the transport of military equipment over long distances in dry climates. Davis's experiment was a success, as the animals proved significantly better suited for the demands placed upon them than the horses and mules. However, Fort Verde was captured by Confederate soldiers in 1861 and, at the end of the war in 1865, the herd of camels was sold by the U. S. to help provide needed funds for the Reconstruction. The fort was decommissioned in 1869, and by that time, the herd had grown from 73 camels to 100. Thus ended the great camel experiment, never to be resurrected again. The general store and critically-acclaimed restaurant now in place is a beautifully designed example of the German-inspired ranch architecture of the 1800s, with its use of white limestone and wooden accents. The restaurant was very crowded--surprising, given its location in the middle of nowhere--but the food was very good. Most of us had salads or designer sandwiches along with some killer pie. 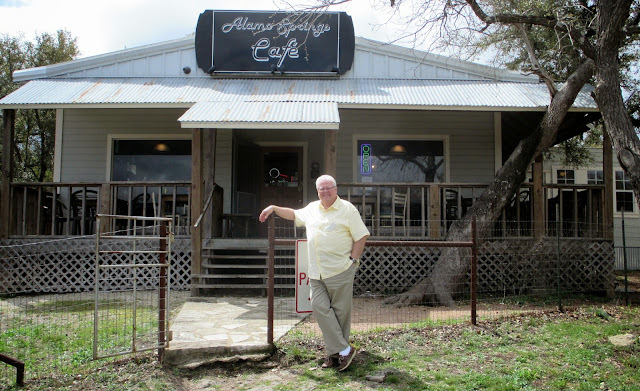 The next day brought about a short trip to Comfort, Texas to have lunch at the Alamo Springs Cafe. This ramshackle restaurant, also in the middle of nowhere, has been named by Texas Highways magazine as having the best hamburger in Texas--I kid you not. Sandy and I have visited Fredericksburg a few times over the years, but the place seems always to be growing. Certainly a shopping mecca with perhaps a hundred quaint stores and restaurants along the main drag, it is also home to the Nimitz Museum of the Pacific War. This museum has become quite impressive as it has expanded over the years, and I will have to visit it another time in order to include it in a blog post. We didn't have enough time on this day to begin to see everything along the main shopping drag, so we did what every husband would do in such a circumstance: We drove back to the RV park for a nap and left the ladies to have their way with their credit cards, God help us. Tomorrow is departure day, this time to Austin. Stay tuned! We're finding that we just don't spend that much time at the homeport anymore. Our two-month summer trip in Phannie and the freedom she gives us to visit the kids often has had the surprising effect of making us realize that we are a good deal happier in our rolling home than in our stationary one. We've found that we don't need much of a reason at all to leave town and launch on a new adventure. Such was the case when we learned that snowbird friends Ed and Marilyn were heading straight through Texas en route to their winter home in the Rio Grande Valley instead of their original itinerary through Louisiana. We contacted Eddie and Janet, members of the same group of retired RV characters who somehow found each other and continued to maintain a loose orbit, bumping into each other at various times and places, some more often than others. There appear to be common traits among these friends--a quick wit, I suppose, as there is always much laughter when they're together, but then there is the more compassionate side, as well. None of them would dream of exploiting another's foibles, infirmities or affectations. Not having been humiliated for a while, I offered to hook up with Eddie and Jan for an intercept of Ed and Marilyn somewhere along Ed's route. The stop decided upon was Kerrville, a very pleasant burg in the Texas hill country. No problem for us, and well within the 250-mile daily traipse that we generally set for ourselves. The park of choice was Buckhorn Lake RV Resort, a nice one that is, of course, in our 'best of the best' listing page. Sure enough, the old rod was almost eaten through in one place, so my timing was pretty good, I thought. I'm not sure why this chore bothers me so much, but it has become a metaphor for the dark side of stick-and-brick home ownership and why I seem to be moving ever more toward "slipping the surly bond," as John Magee put it in High Flight. While it is a great house, it owns us more than we own it, I'm afraid. On departure day for Kerrville, we awoke at 8:00 a.m.--daybreak for us--and actually pulled away from the house at 11:30. Now you should know that we get no end of grief from Ed and Marilyn and others in their orbit for our indifference to the old bromide, "the early bird gets the worm," which is obviously a mantra that they learned in some cult brainwashing they don't talk about. Ed often writes in his blog about the insanely early times he and Marilyn arise--times that are in very small numbers that I didn't even know were real, having only heard rumors of their appearance on clocks. These are nice people, but they obviously need an intervention. Our leisurely lifestyle carries over into the en route portion of our travel in Phannie. We often stop for lunch--usually a sandwich that we put together in the bus--at a roadside park or picnic area. If it's a nice place and the weather is pleasant, we may go outside, taking our time and enjoying our surroundings while we eat. Such was the case when we stopped at a very picturesque little roadside park between Glen Rose and Hico. We took in the hilltop view and, as we often do in our conversations, wondered aloud as to what day it was and, upon deciding that it was a workday, reveled in the notion that that meant nothing to us. As we lollygagged around there over lunch, I noted that we would run past the ETA that Sandy had given Marilyn earlier, and I figured there would be a verbal flogging awaiting us at the RV park in Kerrville. I was not disappointed. Much merriment was made over the fact that we arrived after the park office had closed and, if that weren't enough, we disrupted everyone's dinner plans. I tried to defend myself by noting that the sun hadn't gone down yet, and we hadn't noticed any chickens going to bed, something that would have made Ed conk out, for sure. It was all good-natured, of course, and we didn't mind being fodder for their jokes. We had a nice dinner at Mamacita's, a large and popular Mexican restaurant, where everyone enjoyed their selections, especially the excellent fajitas Sandy and I ordered. Who knows what we will get into tomorrow? We don't really care because, as Ed always signs off on his blog, "Life is good." We have relocated to Houston to celebrate Mindy's birthday, but I'll wrap up our Galveston experience with this post. We took the ferry back toward Crystal Beach to enjoy another lunch at Stingaree's, which we have decided is our favorite seafood restaurant in the area. It was just as good as before, and we will not fail to eat here again when we return. Our wait at the ferry terminal was very short both ways, and we enjoyed watching the seagulls and dolphins play as we made the short journey across the bay. When we returned, we decided to take a tour of the Bishop's Palace, a mansion built over a span of six years in Galveston's golden age at the close of the 19th century. It has been designated as among the 100 most important buildings in the United States. Built at a cost of $250,000 ($6,000,000 today), the ornate Victorian stone structure consists of 19,000 square feet and includes a basement and three floors above ground. It was built by wealthy attorney Walter Gresham and later sold to the Catholic Diocese of Galveston as the residence of Bishop Christopher Byrne, hence the name Bishop's Palace. Prior to this, it was known as Gresham's Castle. Its construction was sufficiently strong to withstand the onslaught of the great storm of 1900, during which the Greshams sheltered many local residents and likely saved their lives as lesser homes were swept away. Damage to the mansion was limited to broken windows and a flooded basement. So many elements of the house, like the stained glass windows, are of rare importance and supplied by fine craftsmen from Europe and elsewhere abroad. Guided and self-guided audio tours are available, at the end of which is a pitch for extra donations to help restore the mansion, in obvious need after 125 years. According to the Galveston Historical Society, current owner of the house, the roof repairs alone will cost $3 million. Worth it, in my view, as the house is magnificent and should be preserved. If you get to Galveston, don't miss this and the Moody Mansion, which we've already toured. There is much more to see in Galveston, but we won't get to it all this time. That means, of course, that we'll be back! So, I'll leave you with this shot of Phannie and Mae at sunset in the Sandpiper RV Resort. Until next time, Galveston. We decided we hadn't had barbecue for a while, so we dropped in at Leon's, a modest place on Broadway that has been run by a friendly black family for a long time. When we pulled up at the curb, the joint looked very promising as one of those local dives where they know what they're doing. And so it was with Leon's. When we entered, we got an enthusiastic welcome and, when we sat at a table near the door, the waitress suggested a better table for us in a quieter part of the room, and we accepted. Nice touch. Since we often find that portions of food served at restaurants are very large (undoubtedly to justify a higher price), we have gotten into the habit of sharing a single order, and it turns out that it is almost always plenty for both of us. So, I asked for a single two-meat combo--ribs and brisket--without sides, for us to share. And the photo below shows the generous serving we got for $9.95. We couldn't begin to eat it all and, as a result, we had leftovers for two more meals. What a deal! The barbecue? Well, it was very good and very smoky, with a nice bark. We would go back. During the Civil War, Galveston was briefly under the control of the Union Army after a brief battle with Confederate troops in late 1862. On New Year's Day, 1863, however, the Confederate troops under General John Bankhead Magruder, took the city back and kept it under Confederate control until the end of the war. Having ancestors who served in the Confederate Army, I was not displeased to learn of this turn of events. After the war, Galveston was the largest and most prosperous city in Texas, due to trade through its port, which was the most important in the state. Sadly, the island had its share of bad times, such as the great fire of 1885, in which much of the town burned and left 3,000 homeless. There was also the great storm of 1900, in which 6,000 perished, after which a seawall was built that saved the city from a more intense storm in 1915. If you are a history buff, there is obviously plenty to interest you here. We got this information from displays at a history center at the local library. Galveston had a nice county museum that was damaged in Hurricane Katrina. Although it remains closed for now, it is supposed to reopen at some point. There is also an interesting railroad museum downtown, if you're a train buff. A drive around the island yields some good views of the port, which was eclipsed in importance by Houston after the 1900 storm and the construction of the Houston Ship Channel. Cruise ships dock imposingly in the midst of downtown Galveston as thousands of passengers embark and disembark, mostly on Caribbean cruises. I haven't written much about the rally we were attending, largely because we are still in an exploratory mode with rallies. We've sampled a few clubs with mixed results, but we have only positive impressions about this one. This club is open only to owners of Tiffin motorhomes, so we have a common interest with the participants from the get-go, and we've found them to be very friendly and down-to-earth people, whom we hope to get to know better. We will be attending more of their rallies in the future, so we'll share photos and impressions at a later time. 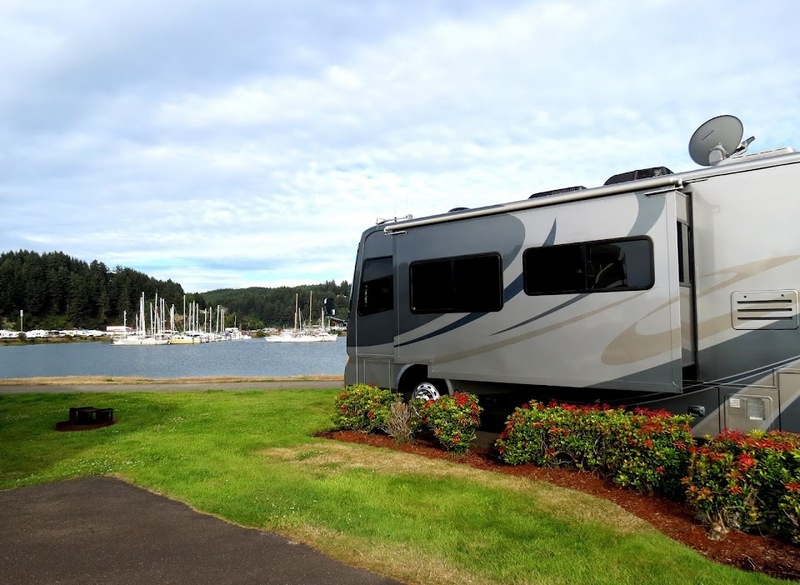 One thing we've learned about RV clubs is that they are very different, depending on the interests of the members. For example, some are centered around playing golf or other sports. Some prefer remote locations while others meet in places where there are lots of urban activities. Some are a bit clique-ish, while others are very open and friendly. We think one of the best rallies we've attended is RV Dreams; Howard and Linda Payne work hard and deserve their reputation for success in this area. Another issue with joining a club and attending rallies is that such regimentation may not work well for couples like us who like to travel long distances for extended periods of time. It may be more attractive for those who are sometime travelers. We'll see. What we do know, however, is that we've met a lot of really nice, friendly people, and that's a good thing. Ever on the hunt for good seafood, we tried a new restaurant named Blvd. Seafood, appropriately named, as it is on Seawall Boulevard. It was a nice place and fairly upscale, with prices to match. Our dish of grilled fish, scallops and shrimp was very good, but we thought it was a bit skimpy for the price we paid. We also ordered their bread pudding, which was prettily presented but a bit bland. Surprisingly, the owner of the restaurant later came to our table, unsolicited, and comped our dish, saying that he had just tried the bread pudding himself and found it lacking. I think this was a first for us in all the eating out we've done, so we were impressed. I would probably dine here again just for the integrity shown by this guy. I told you it was pretty! In the next post, I'll include some information on our tour of the Bishop's Palace. Galveston has always had a special meaning for me, especially as a child. It was the place where I first saw the "ocean" and experienced waves coming ashore. For me as a kid, the Gulf of Mexico, although technically not an ocean, was no less wondrous in its vastness. I had never before seen a body of water that had no shoreline visible in the distance and, when my father explained why, I instantly internalized the concept of the Earth as a sphere. It was a moment of clarity that I still remember. It was also the home of a favorite aunt and uncle, the Munsters, whose house was perhaps the favorite trick or treat target on the island at Halloween for obvious reasons. My aunt was a wonderful rotund woman, perennially smiling and affable, and a great cook to boot. It was she who first introduced me to freshly cooked seafood, and my appreciation for it has never waned. With this in mind, I was not unhappy to return to the island, as we have done from time to time, to find some good seafood and see what has changed. The Sandpiper RV Park, site of the rally, is a very nice park right on the gulf below the seawall and thus protected from the noise of Seawall Boulevard above. The staff is friendly, and the concrete roads and sites are level, so A-plus on the park. 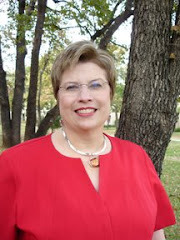 Because of the late start from Salado due to my repairing Phannie's turn signal and our essential stop in the Woodlands to visit the grandkids, we became hopelessly mired in the Houston rush hour traffic. This caused our arrival in Galveston to be after dark, something that I am loath to do. I also had given no thought to what that might mean in terms of our welcoming committee, which happened to be about a trillion mosquitoes. I was wearing shorts, as I customarily do in warm weather, and it didn't occur to me that the news of my bare legs would be telegraphed to every living mosquito in Galveston county once I exited the coach. As I made several trips around Phannie's perimeter hooking up the various umbilical cords and hoses, I began to feel a great deal of insect activity around my lower extremities. I trained my flashlight onto my legs and was astonished at an entire squadron of attack mosquitoes as they happily drilled little holes into my cholesterol-infused stumps. "Yum! Well marbled and tender," I thought I heard one of them say. I beat a hasty retreat back inside the coach, but whelps were already beginning to rise where the little buggers had their way with me. Needless to say, it was not to be a pleasant night for sleeping--itching, yes; sleeping, no. Someone said that I should put hot towels on the wounds before applying medication, but I decided to try my own cure: A pint of Blue Bell buttered pecan ice cream taken orally instead. And yes, it did make me feel better. The rally participants elected to travel via the Bolivar Ferry to Crystal Beach for lunch one day, and it was a nice diversion to sail the three miles across Galveston Bay and watch the seagulls and dolphins put on their show for the passengers. Aboard the ferry with Arthur, one of the rally attendees. Seagulls facing into the wind as we sail; wonder why? The Bolivar Ferries have been operating since 1934 under the auspices of the state of Texas, transporting vehicles from Galveston Island to the Bolivar Peninsula, providing a waterborne connection of state highway 87. However, private entities have operated ferries across this bay since the 19th century. The cost of operating the 540-ton ferries is about $12 million per year, yet this is considered more economical than the building of a bridge or tunnel across the bay. This may finally give way to practicality, however, as the traffic has increased to a point where a wait for boarding might be two hours at busy times. We would never have found this restaurant on the Intracoastal Waterway, had we not had Carol along to guide us. And I must say, it was a wonderful find! The seafood was incredibly fresh and delicious, and the price was right. We will return here before we leave, for sure. With our tummies full, we returned to Galveston and our coaches for a little nap. Later on, we all met at the pool for a weiner roast. One thing for which you should be prepared when you own an RV is the need to make repairs as you travel. No rig, big or small, is immune. It is, after all, a house and a vehicle, both of which have lots of things that can break or go bad. The extent to which you can perform repairs yourself will have a proportional effect on your pocketbook: The more things you can fix, the more cash you can keep. Because I recognize the money that can be saved by preventive maintenance, I am careful to take care of routine service items and follow the manufacturer's recommendations. And years of flying airplanes got me into the habit of checking critical items before departure, as I rather liked the idea of returning to the ground on my terms. It was in Salado, during a pre-departure check of Phannie, that I found one of the rear turn signals inoperative. This confirmed a suspicion that Eddie had voiced when we met in Waco a few days ago; I remembered his mentioning that he thought one of my turn signals might be out. I didn't think it was all that critical at the time, as Mae's turn signal was working on that side, so I elected to continue the short trip to our destination. Luckily, I had a spare bulb in the coach, and I removed the rear light assembly to get at the bulbs. As soon as I did, I noticed that the bulb had exploded and created enough heat to distort rather badly the receptacle that holds the bulb in place. Seeing that another light assembly would need to be ordered, I decided to secure the new bulb in place temporarily with duct tape. (Now I ask you, is there anything any more useful than duct tape? I suppose WD-40 comes close.) If you don't have duct tape in your rig, it's only a matter of time until you wish you did. It is almost essential if your skill level is low like mine. Leaving Salado was tricky due to heavy construction on I-35 in the area. Furthermore, the feeder roads were also torn up and extremely rough. At one point, Phannie's sway in a particularly uneven area was so great that I wasn't entirely sure that we weren't going to tip over! Even though we were going slow, we heard all sorts of commotion in the back as the coach whipsawed from side to side. When we reached Galveston and looked in the bedroom, we could see evidence of the rough ride. The latched doors of the cabinet upon which the bedroom TV is attached had opened, allowing the TV to swing back and forth in midair and, when Sandy opened the rear closet doors, she shrieked, as the closet rod had bent and fallen. All of our clothes were in a heap in the floor of the closet. Now there was an opportunity at this point for me to make a comment about the size of her wardrobe and the carrying capacity of the bent closet rod, but I didn't take it. (That's why I am still alive to write this post.) In all honesty, I couldn't comment because she has made enormous strides in paring down her clothing as she realizes with each trip how much less she really needs. Even so, the closet rod has always seemed too flimsy; I'm surprised that it lasted this long. I'll bet we're not the first to have experienced this problem, and the chances are probably good that the design was improved in later model coaches. A quick trip to Home Depot allowed me to secure and install a much more substantial rod, so there should be no more clothes on the floor, hopefully. More about our arrival and stay in Galveston next time. After a week's stay at our home port, our doctor and dentist visits had been accomplished, and we had reconnected with friends, trimmed some trees, had the garage door fixed, and I gave Phannie and Mae a wash job. On our way back from Houston a few days earlier, we had driven in the rain for a while, so both vehicles needed a bath. I ran Mae through a nearby car wash, but I washed Phannie myself, which is a lot like w*rk, something that I usually go to great lengths to avoid. I guess my principles have their price, however, as I saved about a hundred bucks in the process. Russ, my crackerjack electronics guru, also came by to take a look at the new Kenwood radio/disk player he installed in Phannie. I had been having a problem now and then with Sirius/XM reception, so he decided the satellite antenna had been placed too close to one of the air horns on Phannie's roof, so he moved it to a different location. Once these things were out of the way, Sandy and I began to ask ourselves, "What are we doing here when we could be on the road?" We had been planning to visit another rally, this time of Tiffin motorhome owners next weekend in Galveston, so we decided to leave a bit early and take a detour to see some friends and relatives in central Texas. Our first stop was in Waco, where we met Eddie and Jan, some really nice Wacoans who are mutual friends of Ed and Marilyn, Bob and Janet, Jesse and Ginger, Mike and Marian, et al. This cabal of RVers run around together when their paths cross--usually in Colorado in the summer and the Rio Grande Valley in the winter--and a good time is had by all whenever they do. It continues to amaze me, after all these years, how common it is for RVers to be very personable people whom we would be happy to call friends. Eddie and Jan were no exception, and we had a great time over lunch swapping stories about each other and some of the other characters among the cabal regulars. After saying goodbye to new friends Eddie and Jan, we drove to Salado, where we stopped at Tranquil Gardens RV Park. This little park, in its very rural setting, was hardly one of the "best of the best," whose amenities we tend to prefer and which we highlight via a link on the home page of this rag. While the sites are fairly level ones with full hookups, including 50 amps, the whole place is gravel and not what you would call picturesque. I told you it wasn't pretty. But cheap trumps pretty. Earlier, when we first arrived at the office, consisting of what appeared to be a well used manufactured building, we were met with many signs and notices on the windows, including some exhorting us to drive no more than five miles per hour and insisting that we have insurance, as the park is responsible for, basically, nothing bad that could happen. Ours was the only big rig in the park, and there appeared to be several relatively permanent residents. So what seduced us to stay here? Well, once again, it appears my standards are for sale; a stay at Tranquil Gardens can be had for a dirt cheap $20 a night with Passport America. As depicted in the photo above, the owner is a bearish man with whom I wouldn't necessarily wish to tangle. 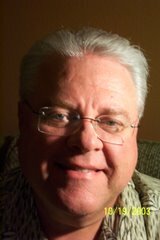 Wearing a long sleeved khaki overshirt, he seemed much too warmly dressed for the 88-degree Texas afternoon. He was more firm than gruff, but his no-nonsense demeanor was not necessarily off-putting, as he was obviously not going to put up with any monkey business in his park, and that's fine with me. I also appreciated his prominent display of the American flag. I mean, what's not to respect about a patriotic guy who doesn't suffer any rabble-rousing in his park? Good for him. When we arrived at the park around 4:00 p.m., I went inside the office to register and found it unoccupied. Looking around, I noticed several more handmade signs giving instructions to patrons finding themselves alone in the office. One of the signs indicated that I should "ring the bell." However, the location of the bell was not immediately evident, so I began to look around the room. When my scan reached 180 degrees behind me, I saw a button on the wall beside the door through which I had entered. Pointing to the button were a couple of dayglo arrows that had obviously been fashioned so as to highlight its location. As I extended my index finger toward the button, I was startled by a rather loud voice from a speaker on the wall behind me. "I see you," said the disembodied voice. "I'll be there in a minute." I quickly withdrew my finger and busied myself by thumbing through one of several old magazines on a nearby table. Then I noticed a video camera in one of the corners of the room near the ceiling, so I knew that I was being watched. The imposing owner soon appeared in his golf cart in the driveway behind Phannie and Mae and methodically recorded the numbers of their license plates. Then he came inside and greeted me in a friendly but businesslike way, where we completed the paperwork and he reiterated the rules, most of which I had already memorized from the ample display of signage outside and inside. Hearing no pushback from me at the end of his recitation, he seemed satisfied that I would not likely be a troublemaker and collected the rental fee in advance. I suppose some folks might resent the somewhat brusque officiousness of the owner, but I didn't, probably because I found him to be an interesting character. I almost wish I had learned more about him. Later that evening, we joined a number of relatives on Sandy's side of the family for dinner at Jody's, a longtime Temple restaurant specializing in all things fried. My chicken fried steak and onion rings were, as expected, delicious, even though I could just visualize my doctors waving their fingers at me for being naughty. The next day, we stopped at Cracker Barrel in Killeen to catch up with longtime friends Linda, Darla, Jody and John, who is a pastor at a local church. We had a great time and literally closed the place down. Thanks to all for meeting up with us! Tomorrow we leave for Galveston.